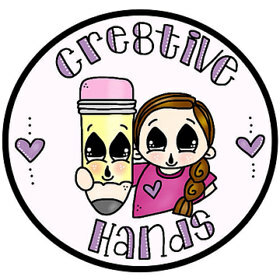 There's a new challenge at Creative With Stamps-and it's for Manly Cards! For my card I used a Dina Wakley stencil on a gessoed book page. I used fire brick and gathered twigs distress inks for the bricks. 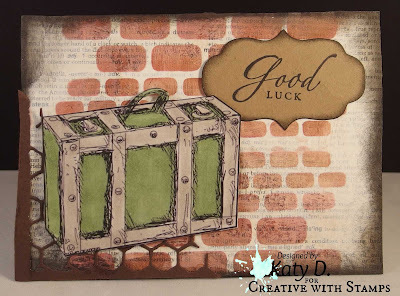 The sentiment shape is a Tim Holtz mover shaker and the sentiment is from Stampin' Up. I inked the edges with graphite black Dew Drop ink. Also, I got a new Sizzix die cut from Tim Holtz and that is on the corner behind the suitcase. The Suitcase! I love this suitcase! It's a digi stamp from Stamplorations (one of our sponsors-thank you!). And I have colored it with Copic markers a green and warm grey. I had to be careful because I colored the suitcase first and then decided to do brick work and then realized I had green and red. And it's not a Christmas card! But I think I was able to make the bricks brown enough. LOL I hope so anyways! I really like how this card turned out. I was going to do a miss you but with all of the graduating seniors-I thought this would be great for a guy who was graduating and leaving-like off to college or the service. We have two great sponsors this month so be sure to check them out! Gorgeous! LOVING the brick and the suitcase!!!!!!!!!!!!!!!!!!!!!! Love the brick background! Beautiful card! Hi Katy...yeah I too I decided the brick late...without any masking I worked my card hehe...and your suitcase in this color???Lovely!!! !The green you have choose is cool I have to buy this...may I ask the number of this green copic color?Lovely color combo and seriously..Great manly card...hugs from teamie..see you soon on my "similar card" with brick..
Great masculine card, Katy! Love the stenciling and die cut on the corner! Great color combo! Great masculine card. I like the colors and the background. Wonderful coloring and very cool card design for a Grad going off to college, Katy! Good job with the digi suitcase and brick wall stencil on a printed page! What a great digi image and love the brick wall and die cut behind the suitcase. I recently got this set of dies from Sizzix - got them home and thought hmmm....but now you have given me some ideas. House of Cards Summer Blog Hop!